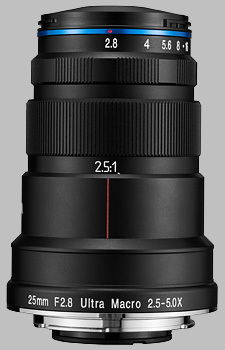 (From Venus Optics / Laowa lens literature) Venus Optics, the camera lens manufacturer who has previously launched a number of unique macro lenses (60mm f/2.8 2:1 Macro & 15mm f/4 Wide Angle Macro), is proud to add another member to their macro products line, the Laowa 25mm f/2.8 2.5-5X Ultra Macro lens. The new Laowa 25mm f/2.8 provides a magnification range from 2.5:1 to 5:1 and offers flexibility for photographers to capture macro subjects with different sizes. The 8 elements in 6 groups design with one low-dispersion element, creates outstanding image sharpness across different magnifications and greatly reduces chromatic aberrations and color fringing. The wide focal length gives a relatively deeper depth of field than lenses with a longer focal length. This feature is particularly essential for photographers who can then stack fewer images for achieving even sharpness across the frame. Dedicated solely to macro applications, the lens is carefully designed with an extended working distance (40mm @ 5x) & small lens barrel. This design is aimed at providing sufficient room for lighting to reach the subject. The lens weighs less than 400g and its compact size makes it suitable for shooting both in the field and in the laboratory. An optional rotating tripod collar is also released for photographers to benefit from mounting the lens on tripods and compose at different angles. Canon EF, Nikon F, Pentax K & Sony E mounts are available for order through Venus Optics official website (http://www.venuslens.net/) and authorized resellers. The suggested retail price (tax excluded) in United States is USD 399/pc. Pricing varies in different countries. The Laowa 25mm f/2.8 2.5-5X Ultra Macro doesn't have any user reviews yet!